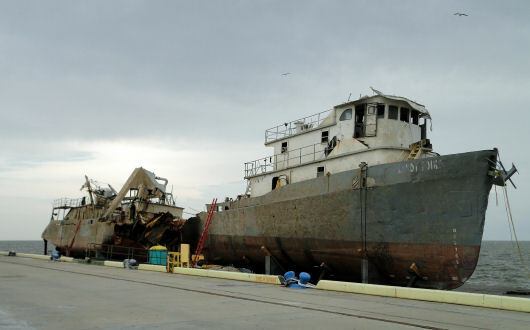 On May 18, 2011, the fishing vessel SANDY POINT collided with a large container ship and sank in the Gulfort Ship Channel. Inland Salvage Inc. was mobilized to remove the oil and fish from the sunken wreck and later remove it from the channel. Because of the extensive damage to the hull, it was decided to first cut the hull in two pieces, using a heavy chain and 2 floating cranes. Meanwhile Argonautics Marine Engineering, Inc. was contracted for assistance with the barge transportation of the hull sections after lifting. A cribbing and seafastening arrangement for each of the sections was quickly designed. Two flat deck cargo barges were outfitted with cribbing blocks and provided with the seafastenings and roll bars and towed to the salvage site. Each hull section was successfully lifted off the bottom, drained, and lowered on the cribbing blocks. After installation of the seafastenings and roll bars, each barge loaded with a hull section was safely towed to the Mississippi State Docks for inspection by the Coast Guard. An article describing this recovery operation appeared in the July/August edition of the International Tug & OSV magazine. Photographs courtesy of Inland Salvage Inc.
Design seafastening arrangement for each hull section bases on the design accelerations.